Illustrated 007, a terrific website devoted to James Bond artwork of all kinds, has uncovered rare original Kev Walker concept art for the U.S. hardcover edition of Charlie Higson’s Blood Fever. As with unused titles, I find this kind of thing fascinating. While the final Blood Fever hardcover did follow this basic design, there are still some notable differences. First, Young Bond is holding a gun in hand. While this certainly gives it a Bondian flare, Charlie once told us that guns were forbidden on the cover of kids books, so it’s understandable why this needed to be changed. Second, the title case runs together as one word, similar to the UK edition. 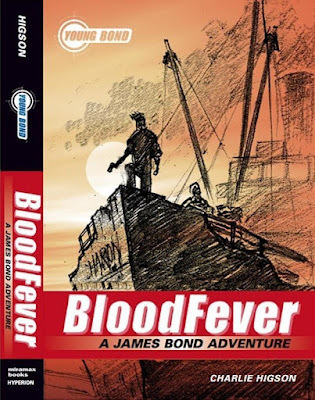 Happily, this was changed, as there is still sometimes confusion whether the book is called Blood Fever (two words) or BloodFever (one word). We can also glimpse the name of the ship in this artwork, which did not appear on the final design. Thanks to Illustrated 007 for sharing this rare art.